If you’ve been taking martial arts classes since you were a child, then there’s a very good chance that you want to continue training as a teenager and an adult. At ATA Family Martial Arts in Aurora, Centennial, and Forney, we offer classes for teens and adults that allow you to continue developing your skills, or if you’ve never taken a class, sign up for your initial training. For teens and adults, martial arts often centers around learning new skills and developing greater strength, balance, and flexibility. We incorporate sparring and weapons training with combative and self-defense techniques so that each student is well-rounded and ready to take on any challenge. We continue to focus on the mental aspects of martial arts as well, helping teens and adults work towards more leadership opportunities both inside and outside the studio. If you participated in our Tiny Tigers and Karate Kids programs, then you are aware of the emphasis that we put on respect at all times. 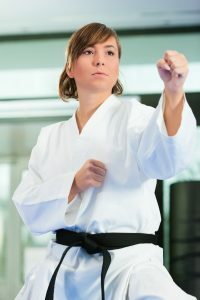 If you’re new to martial arts, then you will understand that it is imperative to show respect to your opponent, to your instructors, and to the other students in the class. No matter if you’ve been training all your life or you’re just starting out, we want you to understand how essential respect for others and oneself truly is. Our teens and adult martial arts classes are designed for anyone over the age of 13, and if you’re interested, then we’d love to have you sign up today. By combining physical growth with mental fortitude, you can develop strength in both mind and body, and learn the skills you’ve always wanted to master. Contact us today by using the form below or by calling the location nearest you.